Charlotte Tilbury is an almost fortnightly discussion point on our beauty podcast The Glow Up, and if you’ve tried the products, you’ll understand why. They’re luxe and gorgeous, but most importantly, they WORK, and we’re never not excited to see a new release from the brand. 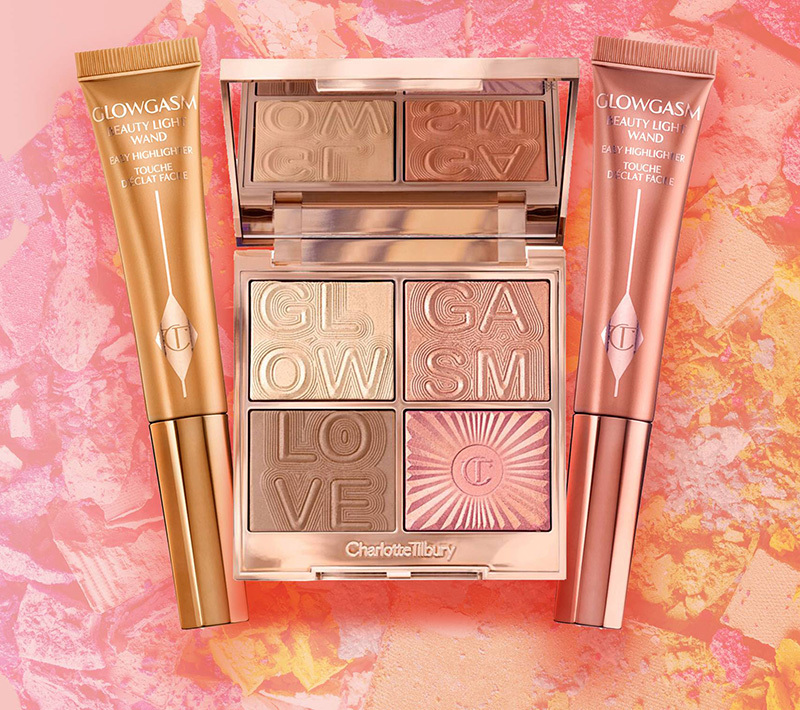 So when we first caught sight of the summer collection, cheekily titled Glowgasm, we were extremely intrigued. We could always do with more glow, you know? The range contains a boatload of new products – three new Beauty Light Wands (€35 each), a Collagen Lip Bath with gold shimmer (€32), an eyeshadow palette (€50), and a limited edition face palette (€75) containing highlighters, blush and a bronzer. I love blush. A pop of colour on the cheeks instantly wakes you up, and I wouldn’t consider my face ‘done’ without it. More people should embrace blush, in my opinion. I’m especially into cream/liquid formulas – hello to the Glossier Cloud Paints, my one true loves – so the part of the Glowgasm range I was most interested in was the two ‘highlight-blush’ Beauty Light Wands: Pinkgasm (rosy pink with golden sheen) and Peachgasm (peach with golden sheen). The cushion applicator won’t be everyone’s cup of tea, but for me it distributes the perfect amount of product. I put a dot of Pinkgasm on each cheek, then blend it out with a little stippling brush – Charlotte describes the effect as inspired by “the beautifying effects of fun”, and I totally see what she’s talking about. Pinkgasm gives cheeks a soft, glowing flush, like you’ve just finished laughing your arse off, or come in from a day in the sun. It has a good deal of gleam in it, so you wouldn’t need to wear a highlighter with it, but I still do because that’s just what I like. I can see myself wearing this into summer and beyond – and now I’m hungry for more cream blush-highlight hybrids. Hopefully Chazza T has a few more of them in her.